The remaining fixes turned out to be something I could knock off in what was left of my lunch break. I tested it all last night, fixed a couple of other bugs I found and did a complete playthrough of the game. Having played through it, I changed my mind about the hit point reward when you leave a dungeon and put them back how it was. The game is definitely beatable anyway so I’m calling it done for now. I may revisit it at some point but I reckon I’ve achieved what I wanted when I set out. I’ll fix issues if anyone reports anything but right now I’m dubious as to whether anyone else will ever even play it. You can grab this latest version is at http://www.pixsoriginadventures.co.uk/Vecalabeth.rar as before. Aside from a Vectrex, you’ll clearly need a Vectrex32 to run it which isn’t cheap and my port certainly isn’t worth that asking price on its own. It undoubtedly makes writing Vectrex games way, way easier than it would be otherwise so if you ever fancied creating a game of your own I’d certainly recommend picking one up. The BASIC variant it uses is still primitive but it’s no doubt a joyful experience compared to the alternative. I had quite a few issues with bugs when I first bought it but the updates since then have improved things no end. My overriding complaint is still the lack of emulation so that I have to load and run my code on real hardware all the time. Aside from the inconvenience, it seems like unnecessary wear and tear on an ever more valuable system. To compensate, I’ve been doing this oldschool and writing the code in a text editor (usually during my lunch) and then only running it when I’ve made decent progress. This isn’t how I prefer to code but it forces me into it. If anyone does play Vecalabeth, please let me know how you get on. I think it’s a decent approximation of the original but I could do with some other opinions. I uploaded a new version of Vecalabeth yesterday (http://www.pixsoriginadventures.co.uk/Vecalabeth.rar) with some bug fixes and gameplay tweaks. I still haven’t fixed invisible passages showing up from certain angles. The menus are still a little fiddly – I may not do too much with these as it wasn’t really an issue when playing. I’ve altered the dungeon generation to include empty blocks in the grid. Believe it or not, this would never happen with the original dungeon generator and it makes the dungeons much more open and playable. It is still possible in my latest version to not have paths through the dungeon but far less likely. I’ve doubled the number of hit points awarded when exiting the dungeon. This feels much closer to the original to me and a whole lot fairer on the player. I’ve made traps about half as likely to be generated. They were a nightmare on the original version. Another major difference in the later Akalabeth is the persistence of dungeon levels. i.e. they are the same when you go back. This didn’t happen on the original and I’m tempted to leave this alone on the Vectrex. I don’t have enough memory to store more than the one level at a time – I could try to save them to the cartridge but I’m going to leave as is at least for now. The random levels offer an easy way to compensate for potential dead ends if nothing else. There are no doubt other little differences but this felt very close to playing the Akalabeth I remember at any rate. The current plan is to fix the bugs in the first list, play through the whole game to see if I can finish it and then if nothing else shows up, call it a beta and see if anyone else ever actually plays it. None of that will take too long so I should be done in the next few days. Readers with good memories may recall that well over a year back I got hold of a Vectrex 32. This is effectively a mini computer on a cartridge that can be used to run BASIC programs on a Vectrex. My first thought was of course to port Akalabeth since all those line graphics are a perfect fit for a vector screen. Life soon got in the way and I managed all of about 3 brief sessions coding, much of which was spent learning the ropes. The ropes are now well and truly forgotten but it’s time this project got finished off so I intend to pick it up again until I at least have something playable. First, a look at where I actually got to. Luckily, I never clear out my PC desktop and all the code is still sat there untouched since boxing day 2016. The last thing I was working on was the initial text/menus at the beginning of the game. You would imagine this would be quick and easy but placing text on the screen has to be done one line at a time with all the coordinates being set manually. It was a bit of a pain as I recall but I got further than I remembered with it. With no keyboard, the interface is going to be clunky but I’ve got all the text on screen for the shop and a currently broken means to select things to buy. I didn’t have any means to exit from this shop so I’ve added that in for the purposes of trying everything out. In the time I did spend on this, I concentrated on the graphics since that is the fun part. The overhead world is pretty much all there. I’d created a random world builder for this based on the original code and can walk around it. I can’t go back into a shop or chat with Lord British as of yet. You can see where the idea for tile graphics in Ultima 1 might have come from in this section since it is effectively tile graphics in a 3×3 grid. There was no means to enter a dungeon either as I’d just bypassed the dungeon code when adding the world map. I made some changes to fix this at which point things started breaking. A load of painful debugging later, I managed to figure it out (a shared variable name). This is the problem with picking up a project a year down the line especially in BASIC which I’m not used to. I am relearning my own code but you really need to have a clear picture of it in your head given just how unstructured the language is. The dungeon is just a predefined array for now with one of each monster kicking around a load of corridors. The beauty of using vector graphics comes into play here as there is no actual 3D programming going on whatsoever. I simply have an array with scaling factors for each block in front of the player and a routine to draw any given object. I then apply the scaling factor when drawing the object to shrink the graphics by the appropriate amount to place it that many blocks away. The disadvantage of vector graphics comes in as well in that it can all get a bit flickery. As with the overhead map, all I can do is move around. Get the player stats in place and inventory. Get the monsters to move around and attack the player. The only job I’m not sure about how to tackle is the first one. I’m seriously tempted to bypass it altogether and just hardcode some levels. Here’s a bit of video of Vecalabeth in action (and yes it really does buzz that much). The flickering is if anything worse in real life. It’s something I’m probably going to have to live with as the platform is even more limited than the Apple II was. I don’t reckon it’s looking too bad though. It moves faster than the original Apple II version ever did and is recognisably Akalabeth at the very least. Let’s see if I can make it actually playable over the next week. I’ve been something of a fan of the Vectrex console ever since getting hold of one a few years back. 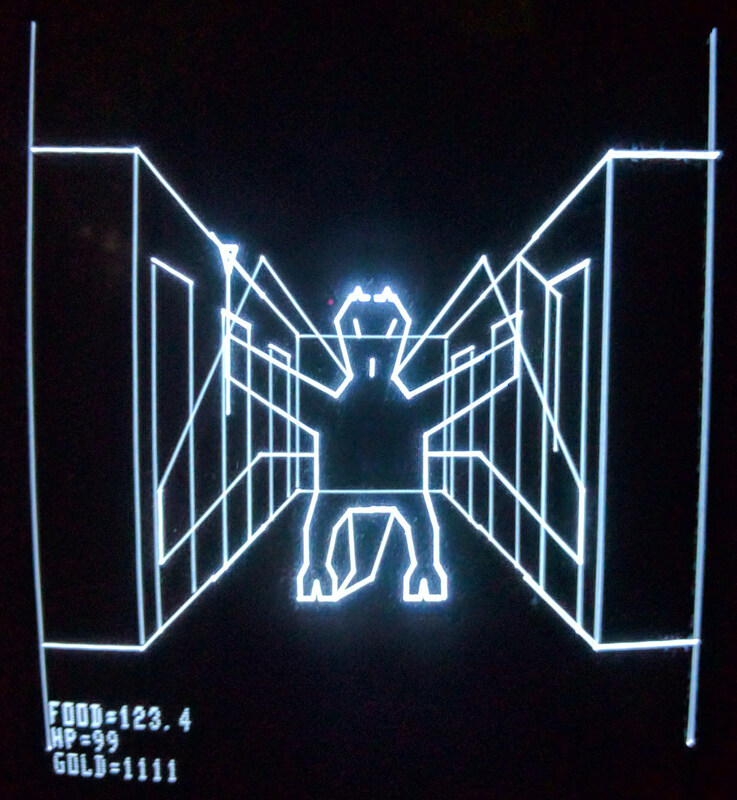 The Vectrex was unique in the history of games consoles as it came with a built-in vector monitor. The pin sharp, glowing line graphics this produces are completely unlike the raster graphics we are all used to and give the console a timeless quality as far as I’m concerned. I’ve always fancied having a go at programming on one but never built up enough courage to take the plunge into the assembly coding that would be required. Thanks to a newly released cartridge, (the Vectrex32), I no longer need to. 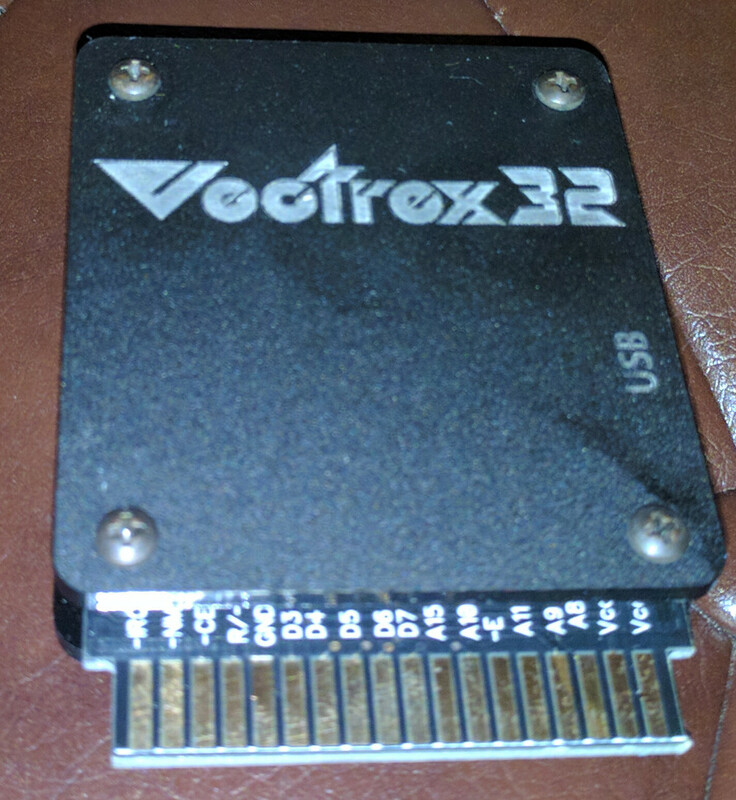 The Vectrex32 plugs into the Vectrex like any other cartridge. The difference is that it’s a 32 bit computer in its own right that takes over all the processing duties of the console. This means programs can now be written in BASIC instead of assembly and it vastly increases the processing power available. In addition, the cartridge can interface with terminal software on the PC via USB for easy debugging and copying the basic code over in the first place. Having spent a few hours playing around with it, it’s quite a neat system and it didn’t take long to get my first code up and running. I am finding that I need to stop each program running entirely before copying over my new version of the code every time otherwise I got file corruption trouble. This is slightly tiresome but not a major deal now I figured it out. The other snag with the Vectrex32 is that I need the real hardware to be able to try to run my code. I’d really hate to wear out my Vectrex and would prefer an emulator option in the long run. 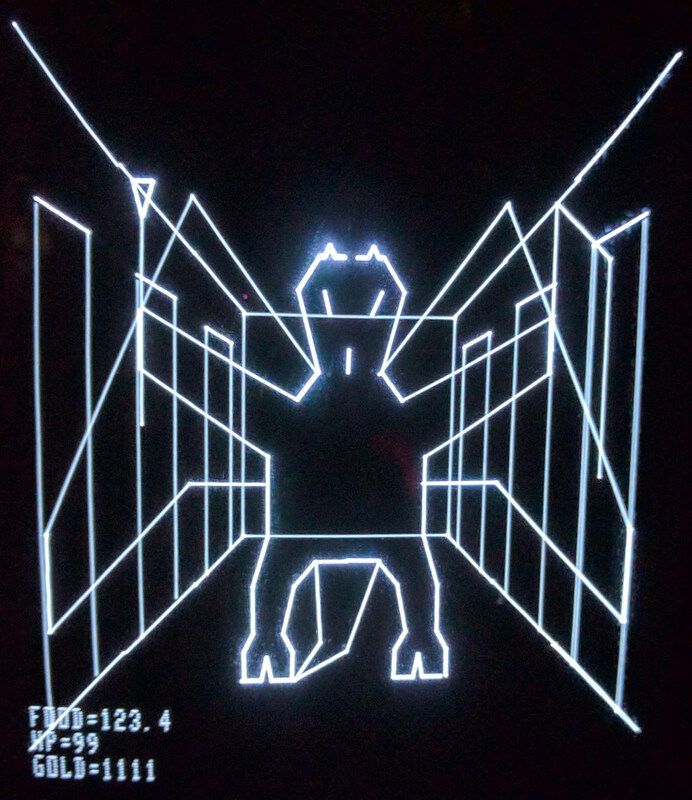 Hopefully, the option to code in a high level language will produce a flood of new Vectrex games. I’m going to be giving it a go at least and the project I’m tackling is a reasonably faithful port of Akalabeth onto the platform all those line graphics were clearly meant for in the first place. How successful this will be is yet to be seen as there are still hardware limitations to deal with (mainly the number of lines and buttons). I thought I’d deal with the most difficult and interesting stuff first. I’ve built a single level 9×9 maze array to give me something to work with and set about getting the movement and graphics in place to wander around the level. This has proved considerably easier than I expected actually. You basically draw what’s on the left, middle, and right directly in front of the player, then scale it down a little and repeat, and just keep going scaling it down a little more for each grid of the map. No maths skills or understanding of 3D were needed whatsoever which is probably just as well. 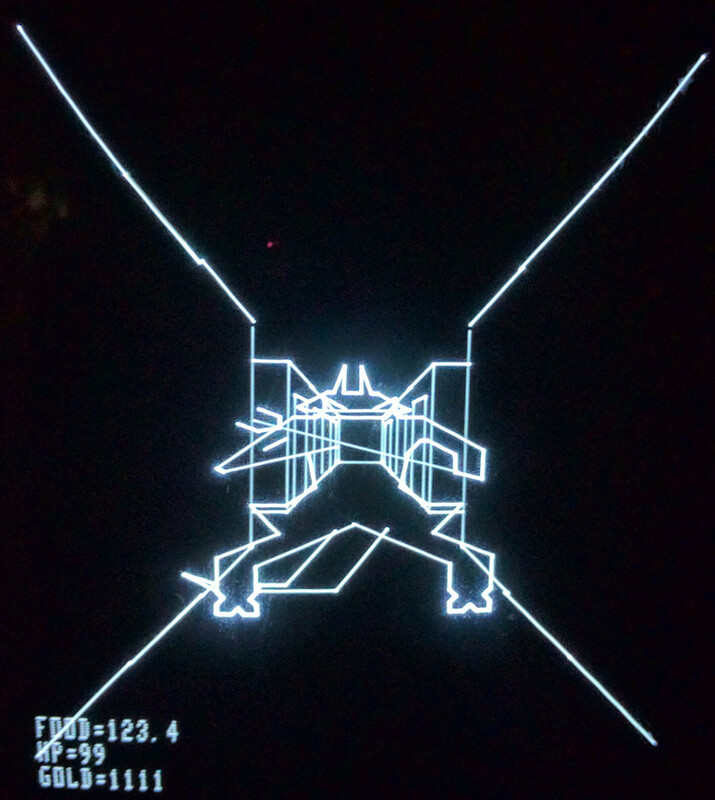 Something you don’t realise about the Vectrex until you start programming on it, is that the lines are all effectively drawn with a virtual pen that you have to move around the screen in the code. This pen drifts a little with each move meaning that your lines don’t necessarily meet up despite having the same coordinates. I keep having to reset my pointer to the middle of the screen and draw things in chunks to get around this. I only started this weekend and have got as far as being able to walk around the maze, go through doors and have drawn the graphics for a couple of monsters. The Vectrex can only really handle one monster at a time reliably or the cartridges 2K buffer runs out of space + the screen starts flickering with the pen not being able to keep up. This means the monsters in this version will be able to hide behind each other. I reckon with chests, trap doors, ladders, etc. they are much simpler graphics and it will be OK to show all of them at once. I considered porting the code from the original Akalabeth since it was also written in BASIC but the two variants on BASIC looked far too different for this to be worthwhile. Instead, I’ve written everything from scratch so far other than borrowing the monster drawing code. Even this is quite different but I can still extract the coordinate numbers and scale them down a little to suit my needs. I may borrow some more of that code in the long run for maze generation and the like but I’m nowhere near that point yet. The next stage will be to finish implementing the graphics for all the different monsters and objects, then I’ll have a go at putting some actual gameplay in. I’ll release the source code once there is something worthwhile to share. In the meanwhile, here’s a few screenshots of what it looks like so far, including a close up of the fearsome balron. You’ll never be able to get quite that close to it when I’m done as you shouldn’t really be able to occupy the same square. It already seems a long time ago but just over a week back, I got the unlikely chance for a tour of Portalarium and questions with Richard Garriott. 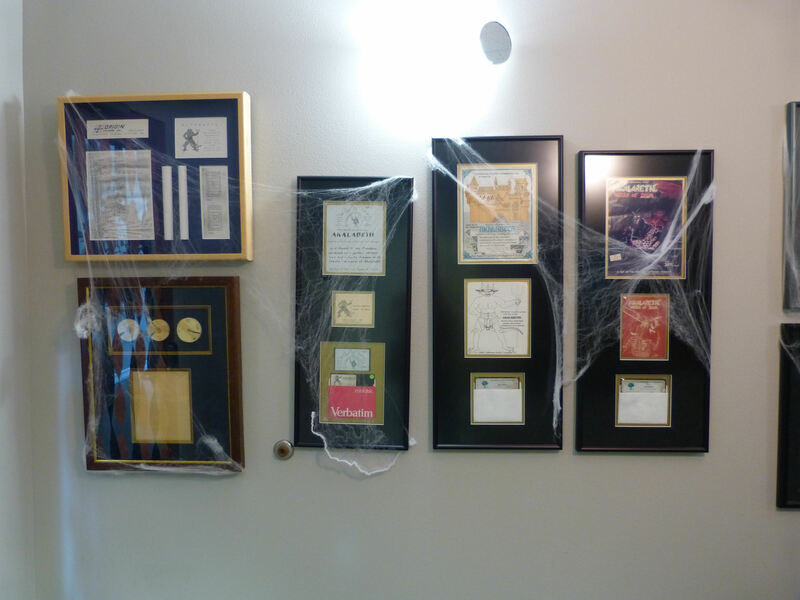 The offices are on the 7th floor of an unassuming office block in downtown Austin. This is the first section with the bottom left being some of Garriott’s pre Akalabeth games on paper tape + his written out code which never got punched in. The earliest Computerland Akalabeth case contains a version on cassette as Akalabeth actually predates the Apple II disk drive. He doesn’t think he sold any of these but wasn’t entirely certain so there may be one out there somewhere. 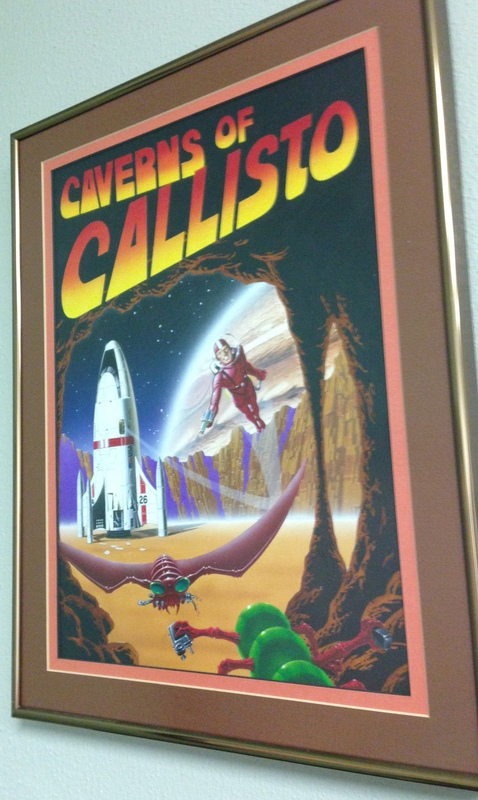 Going further down the corridor there is the original artwork for just about every Ultima game as well as some Destination Games displays but I don’t have photo’s to share unfortunately. 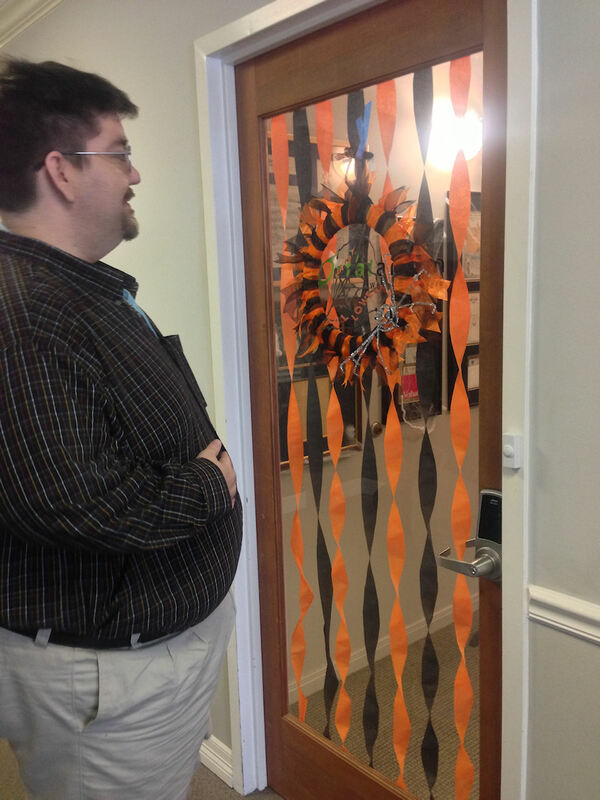 We strolled through some of the developer’s offices after this. One of them was working on removing the Garage Sale text from the Ultimate Collector artwork so it looks like it’s going to have a name change. The name Ultimate Collector was apparently “borrowed” when a TV show of the same name contacted Garriott and he liked the name so much he thought he would use a variant on it. 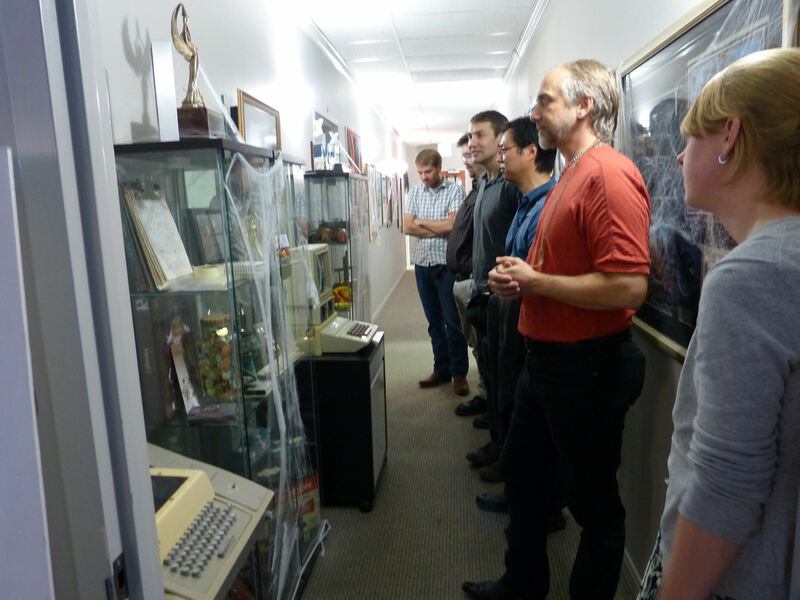 The Portalarium offices are quite a modest affair at the moment and we were soon back in the main corridor where at the far end there is the original Apple II used to write Akalabeth and the early Ultimas, permanently set up running Akalabeth these days. There is also a small but growing new collection of toys which has been inspired by all the cool items the team has come across making Ultimate Collector. Another recently acquired item is a teletype machine exactly the same as the one used to punch in the pre-Akalabeth D&D games. With the tour concluded it was back to the conference room and a Q&A session. I can’t speak for everyone else there but this isn’t the sort of thing I’m used to and it’s hard not to get more than a little starstruck. It’s not like RG isn’t an easy-going sort of guy but I’ve thought of a lot of questions I should have asked afterwards. In no particular order, this is what I remember from a week later much of which I’ve already covered in a previous post. One of the questions that came up was whether he would be able to help track down a copy of Wing Commander 2 on the SNES. 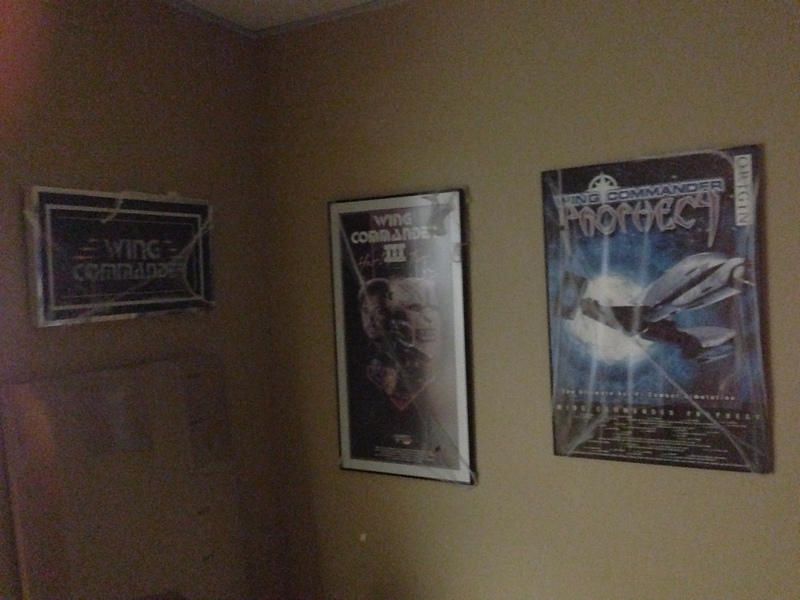 This has been a holy grail for Wing Commander fans for a long time. The game was sent out to reviewers and full write-ups appeared in magazines back at the time but it never went on general sale. It even had some enhancements to the original version such as colour communications screens. The good news here is that RG was extremely positive that he may have a copy. He said that he made sure to get a copy of every Origin game and 10 copies if it was Ultima and thinks that with WC2 getting that far he will almost definitely have it in storage. The downside is that he wouldn’t just let us rummage around for it so we will have to wait some time. I took the chance to ask if that could also mean he had a copy of The Lost Vale. He didn’t think it had ever got finished but I’d take the word of Sheri Graner Ray here and assume that he just didn’t follow it too closely at the time. Going on what he said previously, there must be at least be a slight chance that he may just have a copy but we’ll have to wait for that alongside WC2 SNES. There was some talk about Ultimate RPG although it’s clearly in an early stage. He discussed how Portalarium’s Poker and Ultimate Collector games are necessary building blocks towards the technology needed to make Ultimate RPG within a small company like Portalarium. He confirmed that he would be appearing in Ultimate RPG and it would always be him playing his own character just like in Ultima Online. Inevitably there was some talk of space travel (which he thinks will be as affordable as a first class airplane ticket within 20 years). Although he is now an employee of NASA, it turns out they were less than helpful with his journey to the space station despite the fact that he was doing experiments on their behalf. I gather that NASA didn’t want to be seen as spending USA tax payer’s money on “some rich yahoo’s” jaunt into space. For instance, Garriott had to sign a fairly standard disclaimer before travelling to the Space Station. NASA never got around to countersigning this and 3 days before the flight tried to change the terms so that RG wasn’t allowed to take photo’s through the windows owned by NASA, take photos of the NASA owned portions of the station or actually go on the NASA side of the station in the first place (more or less negating the first two). The rest of the astronauts thought this was as ridiculous as he did and advised him not to sign it since they could hardly stop him flying at this point. After being further pushed to sign it however, he had the bright idea of getting NASA to agree to add a final clause that all terms were under the guidance of the mission commander on the space station (this was actually already the case anyway and this would just reaffirm it). The moment he arrived the commander welcomed him on board, told him he could go wherever he wanted, take any photos he wanted and not to feel the need to ask again. To get back to Earth and Ultima games, the topic of Mount Drash came up somehow. The story is that Keith Zabalaoui (a friend of Garriotts who was credited on Akalabeth) had already written the game but Sierra weren’t going to publish it unless they could use the Ultima branding to increase sales. The game was never intended to be an Ultima but Garriott gave this his blessing to help his friend out, hence Ultima – Escape From Mount Drash. This makes it a legitimate part of the Ultima series as far as I’m concerned and a whole lot more collectible (if that is possible). I might even be prepared to fork out the money myself now if the chance ever arose although I’m not so sure I wouldn’t rather buy another bookcase full of less extreme vintage software for the same price. I asked about Ultima 4.5 which is something I’ve been curious about ever since I heard of it. According to an RG interview I read a long time back Ultima 4.5 and Ultima 5 were being developed side by side for a while and I wanted to learn more. Garriott didn’t think this was the case however and said that Savage Empire was the first time they had tried to reuse an engine. He went into some detail about the thought process behind each of the Ultima spinoffs. The original idea was that reusing the same engine would mean that the game could be made for less than the original which is certainly what I would have expected. However with Savage Empire, it apparently was so much work to strip out the original assets that it ended up costing just as much as Ultima 6 to make. They thought could learn from this with Martian Dreams but that also cost just as much and both games sold less than the mainline Ultimas casting questions on the whole notion of engine reuse. With the U6 spinoffs not entirely going to plan, a different approach was taken with Serpent Isle whereby the original game assets would still be used for the most part which was supposed to keep costs down but this plan failed once more. It occurs to me now that I should have asked about Crusader at this point, which I’m assuming was Plan C. If so this probably worked out better by using the engine for a completely different genre of game and thereby not just appealing to a subset of those that bought Ultima 8. LOAF asked about the Ultima anime which was supposedly made in Japan in the 80’s. Garriott was adamant that there was never any such thing which would certainly explain why it hasn’t surfaced by now. I would assume that the screenshots that exist were simply created for a Famicom TV commercial which sounds like a far more likely explanation. The only other things I can recall were a mention of Ultima Forever as he had just been out for dinner with Paul Barnett the day before and agreed to appear in the game travelling around in the skies. He thinks their heart is in the right place for U4E but he hasn’t seen the game so couldn’t give an opinion on it. We also got an impromptu illustrated guide to the iconic shapes of the Wing Commander 1 fighters (and other things), which Garriott considers to be far more memorable than those in later games. I also recall asking (more to fill an awkward silence than anything) whether Time Bandits really was the inspiration for the cloth maps which of course it was but we all knew that anyway. Our hour was up almost as soon as it had begun. 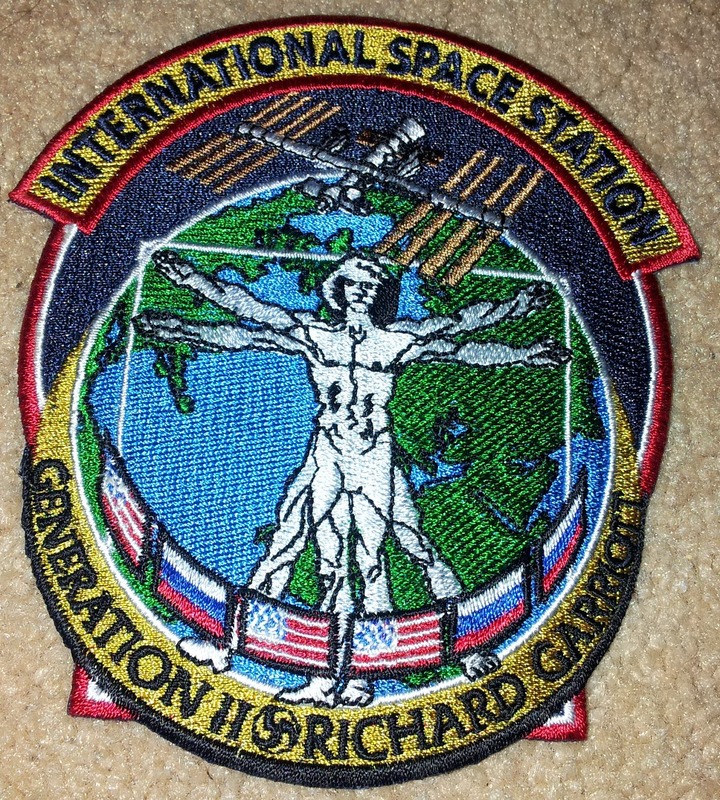 We got some final photo opportunities and there was one little bonus when we were gifted Richard Garriott space suit badges. I came out slightly shell shocked and I still can’t quite believe I got to do this in the first place. Many thanks to Lord British for taking the time to show us around and also to Loaf and Chris Reid for all but one of the photo’s on this post.